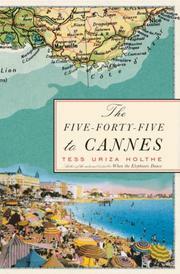 Holthe shifts from the World War II–era Filipino setting of her richly original debut novel (When the Elephants Dance, 2001) to the contemporary Riviera in this novel of linked stories about characters whose lives jostle and sometimes collide along the French-Italian train line to Cannes. In the opening story, the collision is literal. Chazz, a troubled, wealthy American, is fatally struck by a car outside the train station. He has been physically running away from two train hustlers, but on a deeper level he has been running from his fear that his wife Claudette is about to end their marriage. Chazz’s death is witnessed by an elderly French Jewess whose son’s heart was broken ten years earlier when his fiancée Claudette ran off with Chazz. Meanwhile, the two train hustlers’ younger brother, GianCarlo, yearns for a normal adolescence and attempts to escape the criminal life. Hoping he has already escaped that life is the local ferry pilot, an ex-con who has been raising a little boy named Claudio as his grandchild ever since Claudio appeared, the scars of previous abuse evident, on his doorstep. Hopelessly hopeful, Claudio and GianCarlo, who have their own interactions, face dark fates that readers will find themselves caring about long after the book’s more sophisticated broken hearts fade. One such broken heart is Sophie, a young photographer who once photographed Chazz. On the coast shooting pictures of a famous Italian chef, Sophie finds herself the fourth corner of a romantic triangle when she becomes involved with the chef’s brother, who is in love with the chef’s wife. In the final story, Chazz’s widow Claudette shows up to tie together the love triangles, mixed messages between lovers and lost opportunities. With Maeve Binchy’s talent for interconnected stories, and her tendency toward the sentimental, Holthe is not afraid to enter darker the waters in which her characters sometimes swim but often drown. A talent to watch.